This morning, in honor of Mother’s Day, I am preaching a simple message titled – “PRAYER IN THE HOME.” There is no such thing as a perfect home – a place where no one does wrong and there are no problems. Every home has its problems and failures. 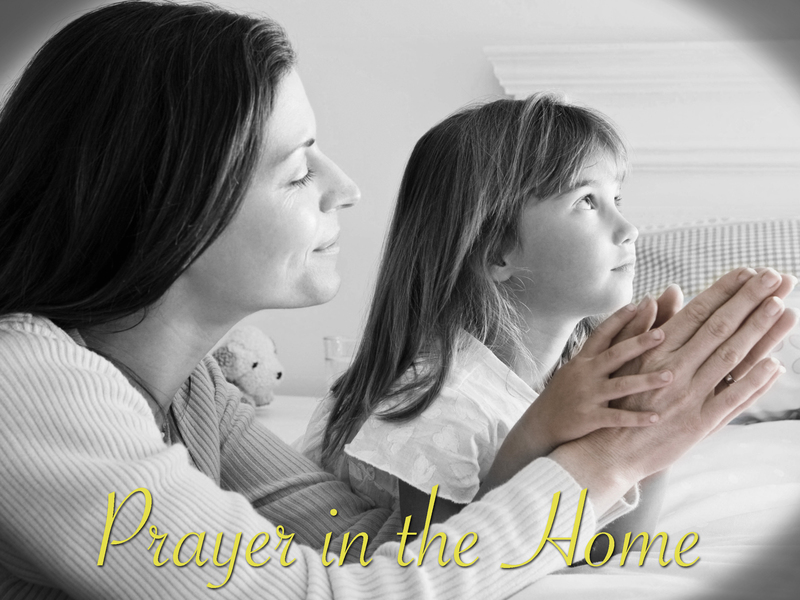 But there is such a thing as a praying home – a place where people believe in the power of prayer and they actually pray. If there’s one thing I remember about our home growing up is that it was a praying home not a perfect home. Overall Background: The passage we just read is about a family that was far from perfect. The head of the household was a man by the name of Elkanah. He was a Levite. He belonged to the tribe that had been designated by God to assist the priests in the Tabernacle at Shiloh and later at the temple in Jerusalem. At first glance Elkanah seems to be a godly man. Listen to verse 3 This man went up from his city yearly to worship and sacrifice to the LORD of hosts in Shiloh. But there’s a problem. Listen to verse 2, And he had two wives: the name of one was Hannah, and the name of the other Peninnah. Even though the Law did not prohibit bigamy, it was understood that you should have only one wife. Why did Elkanah do that? Listen to the rest of verse 2, Peninnah had children, but Hannah had no children…The Bible does not give us the reason. Maybe Hannah was his first wife and because she could not have children, Elkanah decided to marry again. How did all this affect Hannah? Listen to verse 6 And her rival also provoked her severely, to make her miserable, because the LORD had closed her womb. Can you imagine how miserable that home was? Listen to verse 7 So it was, year by year, when she went up to the house of the LORD, that she provoked her; therefore she wept and did not eat…. There was constant taunting and bickering and fighting. How did Elkanah handle all this? 8 Then Elkanah her husband said to her, “Hannah, why do you weep? Why do you not eat? And why is your heart grieved? Am I not better to you than ten sons?” My response: “Seriously?!! You have another woman in the house and she is taunting your wife. It’s a mess. Obviously, you don’t get it?” Here’s an important principle: “You can get so far away from the things of God that common sense becomes uncommon.” You are so unfamiliar with the ways of God that wrong is right and right is wrong. All Hannah could do was turn to God in prayer and I was to learn from her prayer this morning. I. SHE PRAYED FROM THE HEART. 9 So Hannah arose after they had finished eating and drinking in Shiloh. Everyone was eating except Hannah. Keep in mind Elkanah had asked her “Why do you not eat?” This means she was fasting. Let me remind you again that there is great value in fasting. Fasting is not about trying to lose weight. It is about telling God that you are serious about a need in your life – serious enough to set aside food and dedicate that time to God in prayer. II. SHE PRAYED VERY SPECIFICALLY. Listen to verse 11 Then she made a vow and said, “O LORD of hosts, if You will indeed look on the affliction of Your maidservant and remember me, and not forget Your maidservant, but will give Your maidservant a male child…” She prayed to a definite God She addresses Him as the “Lord of hosts” = God of the angelic armies. She prayed for a definite purpose. Many of our prayers fail because there is no clear goal behind them. We assume that God knows what’s best and He will just give it to us. I prayed for Nicole and I got her. Someone might say – “What if I don’t get the answer?” Maybe, God wants to either prepare you to receive the answer or He wants to refine your prayer. Listen again to verse 11 –If You “will give Your maidservant a male child, then I will give him to the LORD all the days of his life, and no razor shall come upon his head.” She makes it clear that she is not asking for a child to make her happy or to make Elkanah proud of her or to have someone who will take care of her in her old age. She wants to dedicate this child to the work of the Lord. James 4:3 says, “You ask and do not receive, because you ask amiss, that you may spend it on your pleasures.” But, there’s more here. 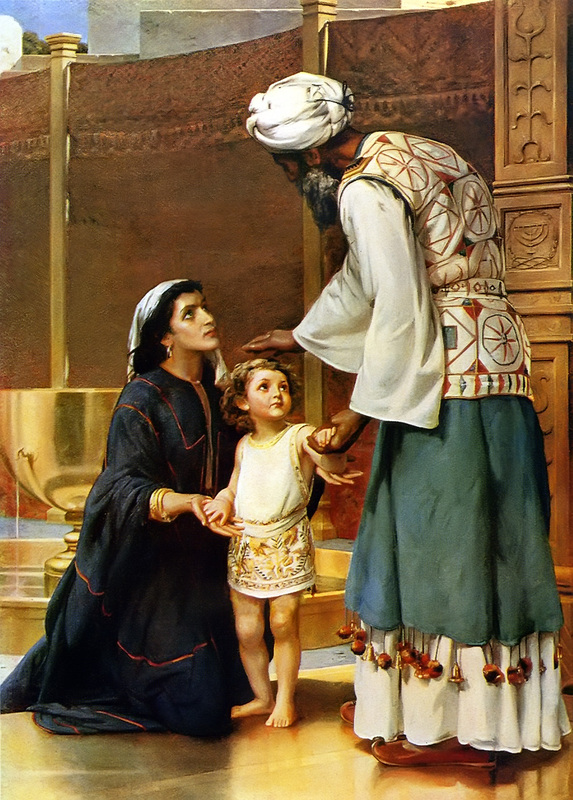 She wants to dedicate this child “all the days of his life.” Keep in mind; the Levites were consecrated to the service of the Tabernacle between the ages of thirty and fifty. That’s not enough for Hannah. She vows that, “no razor shall come upon his head.” When was the last time you prayed a sacrificial prayer? Listen to verse 12 And it happened, as she continued praying before the LORD, that Eli watched her mouth. 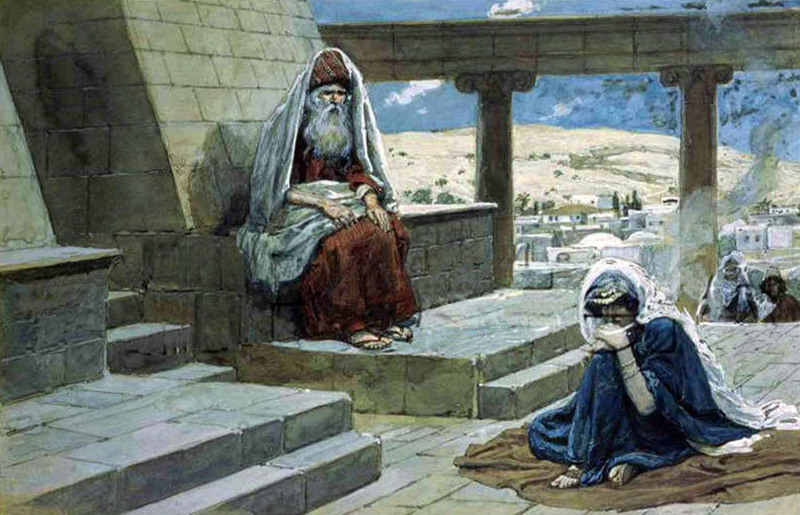 13 No w Hannah spoke in her heart; (In the east when people prayed, they spoke out their prayer. To pray in your heart means she was spiritually mature.) only her lips moved, but her voice was not heard. Therefore Eli thought she was drunk. 14 So Eli said to her, “How long will you be drunk? Put your wine away from you!” When you pray, there will be people in your life who will not understand your burden. They will not be able to sympathize with you. They will accuse you of being a hypocrite and do everything they can to discourage you. Keep persevering in prayer. Listen to verse 15 But Hannah answered and said, “No, my lord, I am a woman of sorrowful spirit. I have drunk neither wine nor intoxicating drink, but have poured out my soul before the LORD. 16 Do not consider your maidservant a wicked woman, for out of the abundance of my complaint and grief I have spoken until now.” I challenge and encourage you today not to give up in prayer. Listen to verse 17 Then Eli answered and said, “Go in peace, and the God of Israel grant your petition which you have asked of Him.” 18 And she said, “Let your maidservant find favor in your sight.” So the woman went her way and ate, and herface was no longer sad. Many people pray but they do not believe that God will answer their prayers. In other words, faith is missing. Listen to Jesus in Mark 11 22 So Jesus answered and said to them, “Have faith in God. 23 For assuredly, I say to you, whoever says to this mountain, “Be removed and be cast into the sea,’ and does not doubt in his heart, but believes that those things he says will be done, he will have whatever he says. 24 Therefore I say to you, whatever things you ask when you pray, believe that you receive them, and you will have them.1. She prayed from the heart. 2. She prayed very specifically. 3. She prayed sacrificially. 4. She prayed perseveringly. Application: How is your prayer life? Are their needs and desires in your life? Have you put them through this outline before? WHAT WAS THE RESULT OF HANNAH’S PRAYER? #1. Her prayer was answered. 20 So it came to pass in the process of time that Hannah conceived and bore a son, and called his name Samuel, saying, “Because I have asked for him from the LORD.” In Hebrew “sama” means “heard and “el” is “Elohim” – the name for God. #2. She kept her word to the Lord. True to her word, 1Sam. 1 24 Now when she had weaned him, she took him up with her, with three bulls, one ephah of flour, and a skin of wine, and brought him to the house of the LORD in Shiloh. And the child was young. 25 Then they slaughtered a bull, and brought the child to Eli. 26 And she said, “O my lord! As your soul lives, my lord, I am the woman who stood by you here, praying to the LORD. 27 For this child I prayed, and the LORD has granted me my petition which I asked of Him. 28 Therefore I also have lent him to the LORD; as long as he lives he shall be lent to the LORD.” So they worshiped the LORD there. #3. God used the little boy in a powerful way. The Nation of Israel was in disrepair. The old order of the judges (Samson, Gideon, and Deborah) was dying out. From every direction the enemy nations were getting stronger. The only leaders over them were the priests but they could not do much. Plus, they were corrupt. They needed a king. Guess whom God used to set up the new order? Samuel. – This is the Samuel who anointed Saul as the first king. All because one young woman suffered and pleaded with the Lord and kept her word to the Lord. Application: Where is prayer in your life? Where is God in your life? Where is Jesus in your life? You may say to me – “You don’t understand what I’ve been through in my life.” All I can say to you is what David said in Psalms 34:18 “The LORD is near to those who have a broken heart.” Also, listen to God’s promise to those who hurt in Isaiah 61:7 “Instead of your shame you shall have double honor, And instead of confusion they shall rejoice in their portion. Therefore in their land they shall possess double; Everlasting joy shall be theirs.” That’s God’s promise to you if you are willing to bring your bad experiences and your pain to Him. “You cannot control the circumstances that you were born into but you can control the direction that you are heading into. 10-24-12Hi there I am so excited I found your web site, I really found you by accident, while I was browsing on Yahoo for something else, Regardless I am here now and would just like to say thanks for a incredible post and a all round entertaining blog (I also love the thmie/desegn), I don? have time to read through it all at the moment but I have saved it and also included your RSS feeds, so when I have time I will be back to read a lot more, Please do keep up the superb job.